Tank size is the first thing you need to consider when choosing which ultrasonic bath is right for you, as it will determine the maximum size of any objects you want to clean, how many objects you can clean at once, and in some cases how long the cleaning cycle will take. Smaller cleaners, such as the B200 and GemOro 1.2, are usually employed as personal or jewelry cleaners. They can however still be used for cleaning very small parts, such as those for model or scale vehicles. 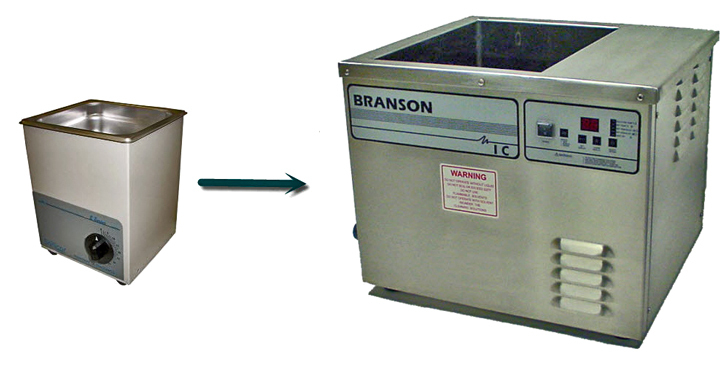 Medium size cleaners, like the Branson 3800 Series, are great for machine shops, dental offices, medical facilities, or the homes of serious hobbyists. Large tabletop ultrasonics, like Crest's CP2600 or the Branson 8800 Series, are targeted at large scale manufacturers, major medical facilities, auto repair shops, gunsmiths, or anybody who needs to clean large parts very quickly.